High school surfer Kayla Coscino joins the national surf team. Photo by Mark Golter. Laguna Beach surfer Kayla Coscino has been selected to the 2018 USA Surfing National team as one of four under 18 girls. 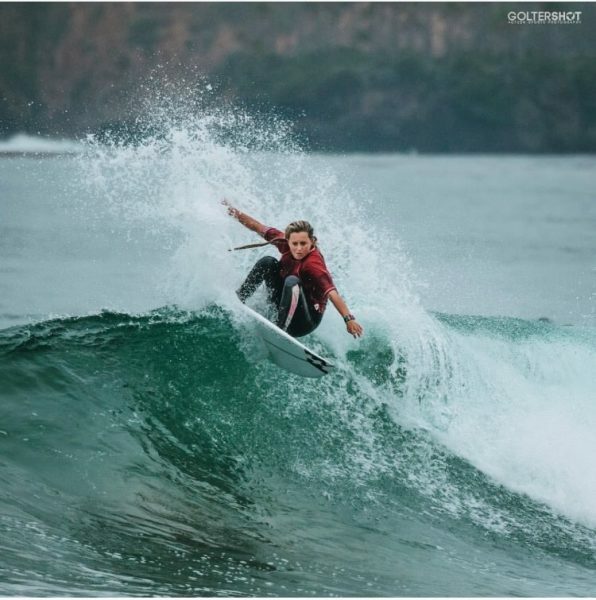 Kayla, who will be a junior at Laguna Beach High School in fall, surfed in the West Coast Prime Series and earned an invite into the USA Championships, which took place June 19-22 at Lower Trestles in San Onofre State Beach. Her results throughout the year and at the championship earned her the selection to the national team. She will participate in the national surf team training program, coached by Joey Buran. It was also announced that USA Surfing would become the national governing body for surfing, granting leadership by the U.S. Olympic Committee. That status cements USA Surfing’s authority as the organization responsible for developing and fielding the first U.S. team when surfing makes its debut in the 2020 Olympics in Tokyo. The author is Kayla’s mother.